AVX Corporation has released what is claimed to be the industry’s first MLV TVS devices rated for 175C operation. 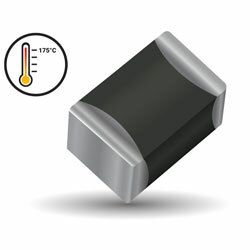 The new TransGuard VT Series high-temperature MLVs offer remarkably reliable bidirectional overvoltage protection across operating temperatures stretching from -55C to 175C with zero derating across the whole range, are qualified to AEC-Q200, and are currently offered in compact, surface-mount 0603 and 0805 cases sizes. They also give some broadband EMI filtering in their off state, which extends their use in sensitive automotive circuits by decreasing the demand for discrete MLCC capacitors and is particularly advantageous considering current market-wide MLCC supply shortages. Application suitability for the new MLVs reaches to circuit protection in other markets as well, and further performance highlights comprise high current and energy handling capabilities, low leakage current, and multi-strike capabilities per IEC 61000-4-2. The MLVs are ZnO-based ceramic semiconductor devices with non-linear, bi-directional V-I characteristics comparable to those of back-to-back Zener diodes, but with elevated current and energy handling abilities and the addition of EMI/RFI attenuation functionality. The new MLVs increase the temperature range of overvoltage protection beyond the series portfolio’s previous maximum of 150C.